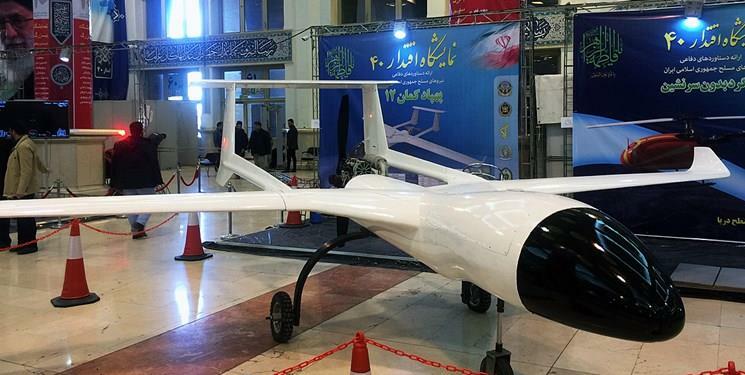 TEHRAN, Jan. 30 (Xinhua) -- Iranian Armed Forces on Wednesday unveiled new homemade drones and showcased guided missiles, Press TV reported. The drones were put on display at an exhibition of achievements of the armed forces. One of the drones, Kaman-12, can fly at the speed of 200 km per hour for 10 straight hours. It weighs 450 kg and can carry a payload as heavy as 100 kg. Kaman-12 can use an airstrip as short as 400 meters and covers a 1,000-km combat radius. Another drone, the renovated Shahed-129, is capable of carrying out surveillance, reconnaissance, and combat operations by using bombs and missiles. The Saeqeh-2 jet fighter, which can carry four guided bombs, was also on display. The exhibition also featured a number of guided missiles to be deployed on drones and fighter jets. One of them was the Akhgar missile, the latest projectile manufactured for deployment on Iranian drones. It is a 1.7-meter-long and television-guided missile with a range of 30 km and can fly at the speed of 600 km per hour. Another guided missile, Qassed-3, can be deployed on fighter jets. It is 5.15 meters in length and can carry a 453-kg warhead with a range of 100 km.